Seeing and studying old picture postcards is always fun. They give us a glimpse of how things looked years ago; what and where the stores were and how people got around. Chattanooga picture postcards are hard to find but postcards from Willshire are a little more common. 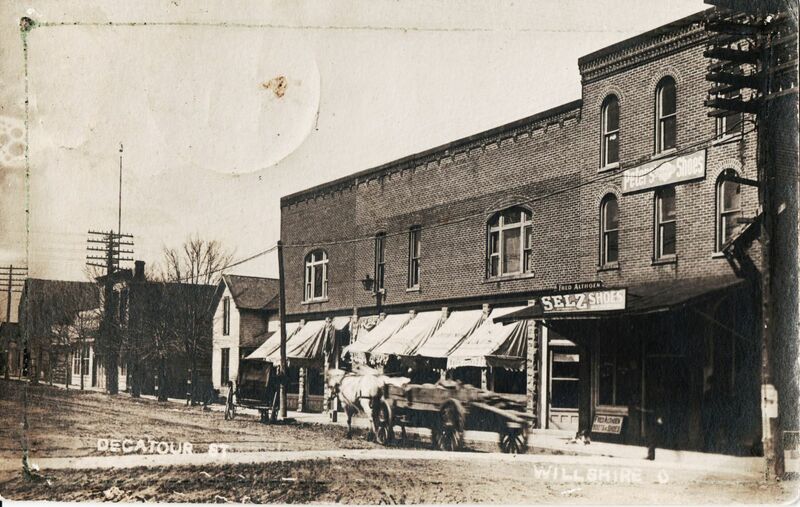 Above is a nice picture postcard of Decatur Street in Willshire, postmarked December 1910, sent to Mr. W.G. Kennedy, 380 Reed Ave, Marion, Ohio. No zip codes back then! The 3-story brick building to the right was Fred Althoen’s shoe and boot store. Apparently he sold only shoes and boots. Fred had three signs to advertise his shoes–the large sign on the building: PETERS’ SHOES; the sign on the awning: FRED ALTHOEN, SELZ SHOES, Chicago; and the sign leaning under the ground-floor window, FRED ALTHOEN, BOOTS & SHOES. I assume Fred owned and operated this store. And I assume the spelling on the signs is correct, although I have also seen this name spelled Altheon.There is a nice-looking dog laying in front of sign under the window and some men standing in the shadows. Looking on down the street I can make out a few more business, as written on the tattered awnings. Next door to Althoen Shoes is FURNISHINGS with what appears to be CARDS printed on top. The next awning appears to be CLOTHING. I can’t make out the words on the next 2 awnings but an awning displaying GROCERIES is folded up against the building. I believe the final 2 awnings are UNDERTAKER and FURNITURE. I compared it to the photo below of Buchanan’s furniture and undertaking service. The frame house to the left looks the same on both photos, as does do the awnings. Stephen S. Buchanan, undertaker in Willshire, Ohio. I am not sure which side of the street we are looking at, but I am guessing the west side. The street looks unpaved and rough and there are a lot of telephone poles. The horses are moving, so the wagon is a little blurry. Willshire had a big fire in June 1908, so depending where the fire was and what it destroyed, these may have been new brick buildings. In 1910, Fred Althoen, age 24, was living in Willshire with his parents Henry and Anna E. Althoen. Henry and Anna had been married 44 years and three of their eight children were still living. Henry Althoen, age 70, was born in Germany and immigrated in 1856. Anna, age 67, and son Fred were born in Ohio. Fred was a shoe merchant and his father Henry’s occupation was own income. They owned their home on Wolcott Street in Willshire. I also noticed that Henry Althoen (1839-1912) served in the Civil War. 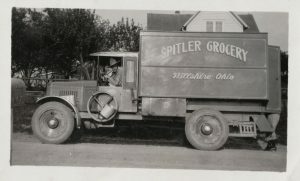 I have an update on another Willshire-area photo, the Spitler Grocery huckster truck photo that I posted a few weeks back. I heard from a very reliable source [a family member] that the man sitting behind the wheel in the huckster truck is Vernon Hoblet. She did not believe that Vernon ever worked at the Spitler Grocery but was just sitting in the truck. The huckster truck was parked in front of his parents’ home [William and Ada Hoblet], which was located on State Route 49, south of the Van Wert-Mercer County Line, just south of the curves. The house was destroyed in the Palm Sunday tornado. The woman standing in the back was likely his mother Ada Hoblet. Thanks to everyone who helps identify these photos! 1910 U. S. Census, Willshire, Van Wert, Ohio, ED 114, p.11A, dwelling/family 49, Henry Altheon; Ancestry.com (https://search.ancestry.com/search/db.aspx?htx=List&dbid=7884&offerid=0%3a7858%3a0 : viewed 25 Jul 2018). Karen, the pictured business block was actually on the north side of Walcot St, where the auction house and parking lot are now located across from Becky’s Restaurant. The pictured house burned down, along with a nearby livery stable , in a fire. The house was replaced with what we remember as the John Knott house, later Neuenswanders lived there while they owned a hardware store located in the pictured brick building. In our memory frame of time, Mike Stuckey had a furniture store in that block of buildings also. The burned livery stable was replaced with the current Willshire post office building. Fred Althoen was Dorothy Heil’s father, and he had shoe stores in a couple locations through the years. His father was a prominent early Willshire businessman. 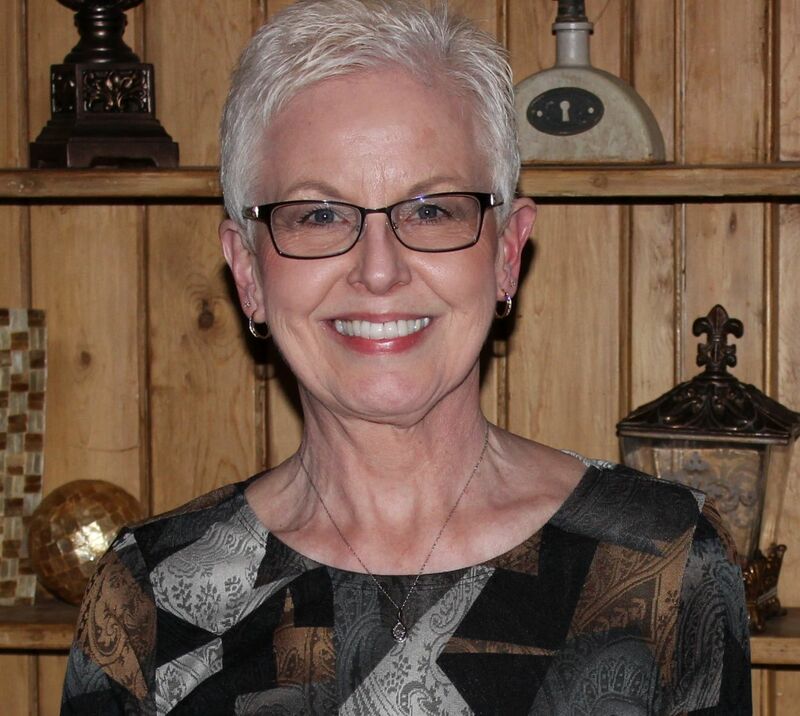 Thanks, Sondra! You are a wealth of knowledge about historical Willshire and its residents! Thank you for the information about those businesses. Do you know where Buchanan’s Furniture & Undertaking was located? Karen, I believe Buchanan’s Furniture and Undertaking was located in that same block of buildings, along with some other businesses that you mentioned. Store front businesses seemed to change frequently back then, as they do now. 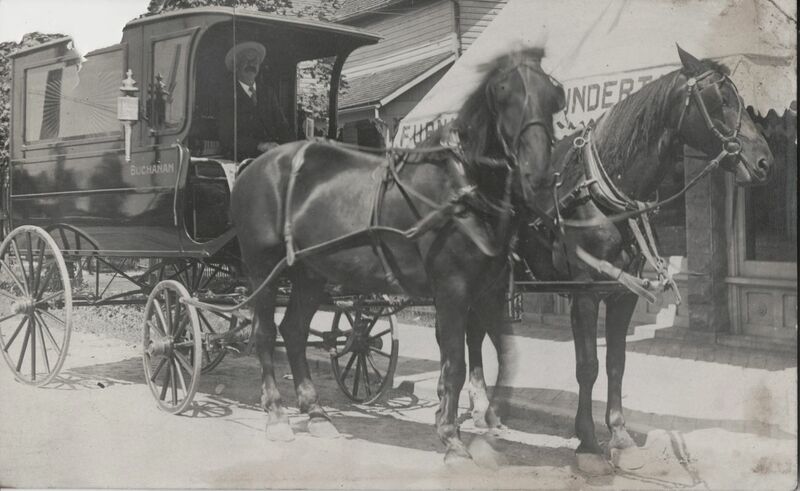 An interesting anecdote about the Buchanan horse-drawn hearse, pictured in another photo, Tom Passwaters remembers it being stored in a building on the Daisy (Buchanan) Hileman property on Simpson St, near where younger Tom and Ted grew up in the elder Tom and Leone Passwaters home. Thanks for that additional information about Buchanan’s and the hearse. So interesting to put some history with the photos. Karen, I believe Buchanan’s Furniture and Undertaking was located in that same block of buildings, along with some other businesses that you mentioned. Store front businesses seemed to change frequently back then, as they do now. 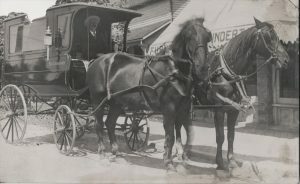 An interesting anecdote about the Buchanan horse-drawn hearse that you pictured….Tom Passwaters remembers that when he was a boy, it was stored in an out building behind the Daisy (Buchanan) Hileman house on Simpson street, near where Tom grew up with his brother, Ted, in the elder Tom and Leone Passwaters home. 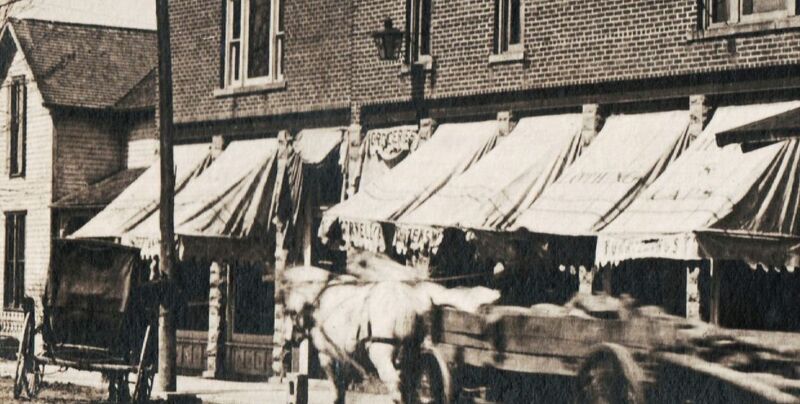 My dad’s(Mike STUCKY) furniture store was purchased from Bucanan’s and upstairs there were rooms for that extended across The top of Neuenswander’s Hardware. You went through a metal door and there were shelves there with a small white baby casket sitting there. There was was also a sign that said, rest in peace.” There was also a stairway that led down to the street, but was boarded up from the outside. I assume that is where maybe bodies were taken up to be prepared for burial. At the back of the furniture store there was a really nice banister and stairway leading up to a room where I think may have been a visitation room. Thank you for that additional information and your recollections about Buchanan’s store. I appreciate the information, which might otherwise be lost. I did not realize that Willshire had so many businesses over the years. I am learning a lot. Thanks for writing. Rozanne mentions a small white baby casket in the storage area in the upstairs of Mike Stucky’s furniture store. I remember that when Lulabelle Scott’s dog “Judy” died, probably in the 60’s, she used a baby casket to bury Judy in her back yard, right next to the Shell station. Lulu was related to Daisy Hileman, but I’m not sure how. We always understood that she got the casket from Steve Buchanan’s old shop. Lulu loved her little rat terrier. It was probably the only dog in Willshire that had a jacket in winter, a leash, and got a regular walking. All the other dogs in town were free to roam and maintain their self respect. What an interesting story. Quite a burial for a special little dog. It would be interesting to see what would transpire if sometime, during some excavation, the casket was uncovered. I could only imagine the headlines. Thanks for writing!